Leisa Rayven is an author that I have read everything she has written and loved every single one of her books! They are fantastically written and there is no one else like her out there. Fans of Mister Romance have been waiting for this one for awhile, but it was absolutely worth the wait, and I think that fans are going to love it! Asha Tate thought a promotion at her job was in the bag, but when she finds out that she needs to land the next bestseller to land the job, she knows she has her work cut out for her. She comes up with the idea to turn her obsession with a man calling himself Professor Feelgood’s Instagram into a novel, featuring his moving poetry and steamy pictures. When he agrees to let her turn it into a book, she never expects that the man behind Professor Feelgood is nothing like she imagined. But despite all the reasons she shouldn’t want him, she finds herself unable to fight the chemistry between them. I absolutely loved Asha and Jake. I don’t want to spoil anything for those that haven’t read, so I won’t get into much detail here...but these two were absolutely meant for one another. There was so much there between them and as the story began to unfold that became more apparent than ever. They had chemistry and a strong connection, and I was emotionally invested in them from start to finish. Leisa Rayven is one of my favorite author’s for so many reasons, but I just keep falling more in love with her writing with each book she releases. Professor Feelgood is a standalone, but I do highly recommend reading Mister Romance first if possible. It is another great book by her, but it is also interconnected to this story and lets you get to know some of the characters seen here better. You really can’t go wrong with anything written by Leisa Rayven, but this one is definitely a new favorite of mine! I will be anxiously awaiting Leisa’s next book, and I know I’ll have to reread some of my favorites of hers while I wait! 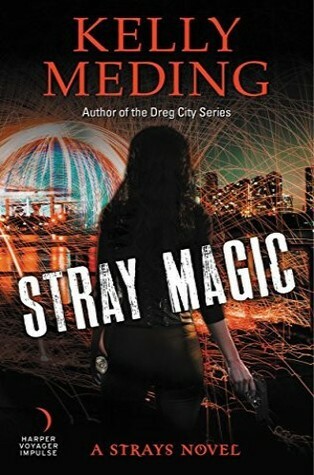 Stray Magic is the first book in Kelly Meding’s new series. It centers on a half djinn/half human U.S. Marshal in the Paranormal Investigations Unit, Shiloh Harrison; which quickly brings to mind two of my favorite authors Shiloh Walker and Kim Harrison. The whole book reminds me of different elements of other Urban Fantasy series and its own unique elements wonderfully blended together to make a very addictive world. There were also moments that brought to mind a movie and I was screaming at the book, “What’s in the BOX!” knowing full and well what was in the box and another part that had me thinking of the show Lost Girl which had me bemoaning the main character cause I knew what would happen. It was a fast paced story something is always happening and as it is in first person this all happens to Shiloh. It takes me a bit to adjust to first person especially if I haven’t read one in a while but I quickly adjusted to this one, it definitely feels like she’s showing me that story rather than telling me, which for me is a good thing. The book starts and it kind of just throws you in and vaguely explains things along the way, she explains enough without over explaining. I understand that there is a short story that predates this one I really think it needs to be re-released. Shiloh was supposed to start her long weekend after a long stakeout but instead of spending some time with her boyfriend she gets called onto a case. Shiloh’s teammates: the incubus Novak, the dhampir Kathleen, the skin walker (and ex-boyfriend) Jaxon and their boss Julius, human. A bunch of vampires took a trailer park hostage, they can’t find their boss, and the vampire master Tennyson has asked for help regarding a bunch of vampires and werewolves that have gone missing. Shiloh spends the whole book trying to figure out what’s going on and getting closer to Tennyson who asked for help and is also helping Shiloh in her investigation. Along the way other things happen and her mom and dad get sucked into the mess as well. The story really takes you on a ride that doesn’t let up. The characters were wonderfully done and the plot was fantastic. I love that while Shiloh is a badass, tough U.S. Marshal she’s also very emotional. She’s emotionally invested in the whole case the case becomes very personal to the whole team and she’s not afraid of her emotions or embarrassed by them. It also gives the reader a better insight into the other characters and how she perceives them helps them seem more real. Overall, it’s a very addictive story that left me cursing at the end because while this case ended there were some loose string left open for the next book.